​For the first time Super Bowl history, the big game went to Tampa, Florida, where the Washington Redskins prepared to defend their title against the Los Angeles Raiders. 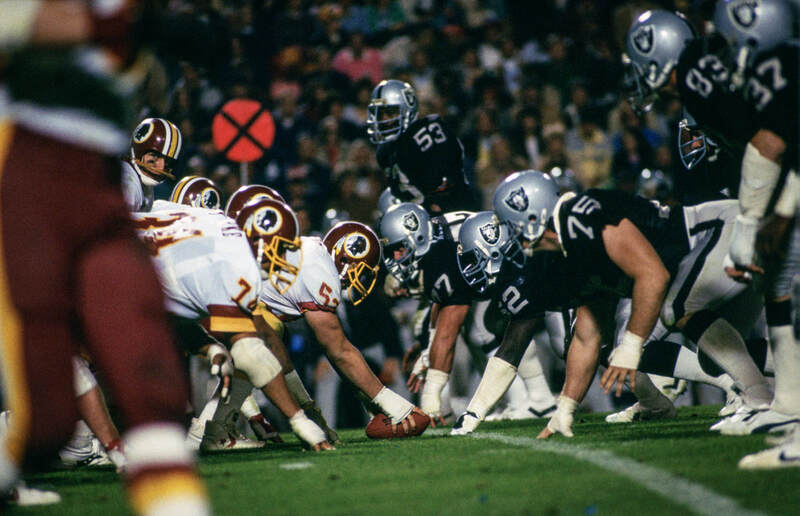 However, despite being favoured by three points entering the contest, the Redskins were dominated by the Raiders from start to finish. The final score of 38-9 was (then) the largest margin of victory in any Super Bowl. Derrick Jensen gave Los Angeles the lead, 7-0, when he recovered a blocked punt in the end zone. The Raiders stretched the lead to 14-0 when Jim Plunkett found wide receiver, Cliff Branch, for a 12-yard score. The Redskins pulled a field goal back making the score 14-3 late in the first half. However, deep in their own territory, instead of running the clock out the Redskins opted to call a screen pass. Shortly after Joe Theismann lofted the ill-fated throw intended for running back, Joe Washington, did linebacker, Jack Squirek step in front of the ball, scooping it into his hands and crossing the goal line in one fluid motion. The halftime score stood at 21-3. Washington initially showed a small spark as they drove down the field on the opening possession of the second half - a drive that ended with a short John Riggins touchdown plunge. However, Mark Moseley would have the extra point blocked - perhaps a sign of how the rest of the game would go for the defending champions. 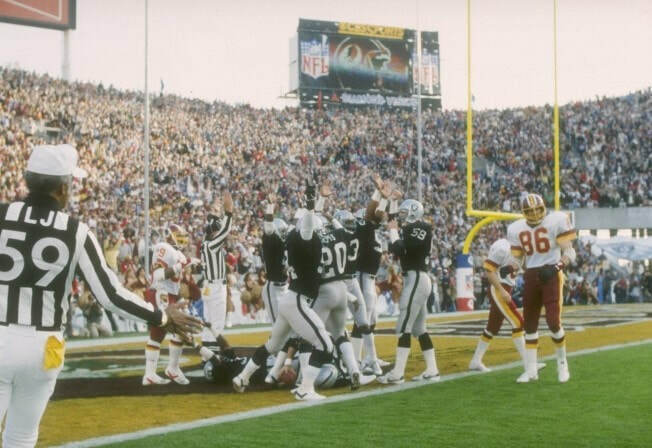 With the score 21-9, the Raiders would quickly score on the back of a 5-yard Marcus Allen touchdown run. The knockout shot would come late in the third period. Marcus Allen would take a hand-off from Plunkett, and after running into a wall of Washington defenders, turned his direction almost completely around, before firing though a small gap in the line. He would sprint ahead for a 74 yard touchdown run - the longest in Super Bowl history. The play was perhaps key in Allen's MVP award, as he would finish the contest with 191 yards and two scores. The Raiders would add a further touchdown in the final period, but the outcome of Super Bowl XVIII was decided long before the final gun. Derrick Jensen scored the first points of Super Bowl XVIII when he recovered a blocked punt in the end zone. Halftime Show:"Salute To Superstars Of The Silver Screen"
Jack Squirek's touchdown late in the first half put the Redskins on the ropes. Marcus Allen on his famous Super Bowl touchdown run. 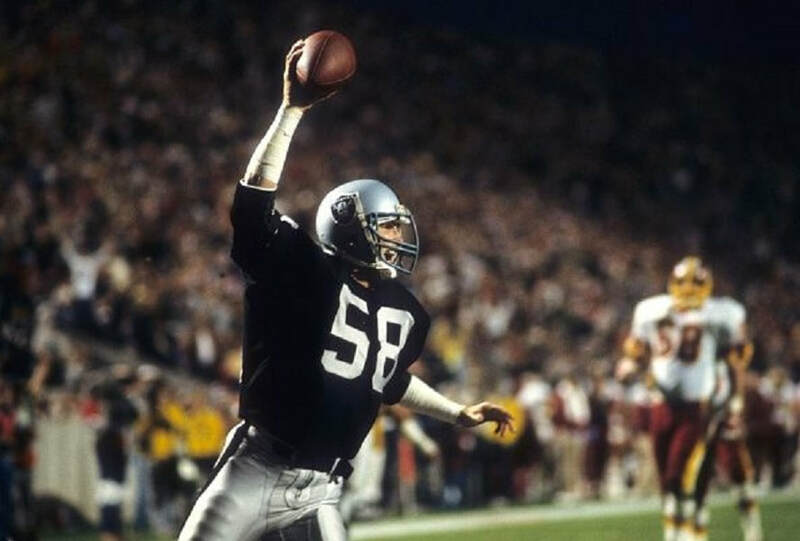 The Los Angeles Raiders 38-9 dismantling of Washington was, at the time, the largest margin of victory in Super Bowl history. Much like the A-Team had been the hotly anticipated television show to be aired immediately following Super Bowl XVII, following the Raiders crushing of the Redskins, CBS premiered the equally anticipated 'Airwolf'. In a similar way, the now infamous '1984' commercial by Apple ran during a time out in the third period. In the following years (and still today) companies would look to equal the impact the advertisement had, with many companies holding back advertisements specifically for the Super Bowl. You can see the 1984 commercial at the end of this article. As well as being aired throughout the United States, the broadcast also went out in the United Kingdom and Canada. 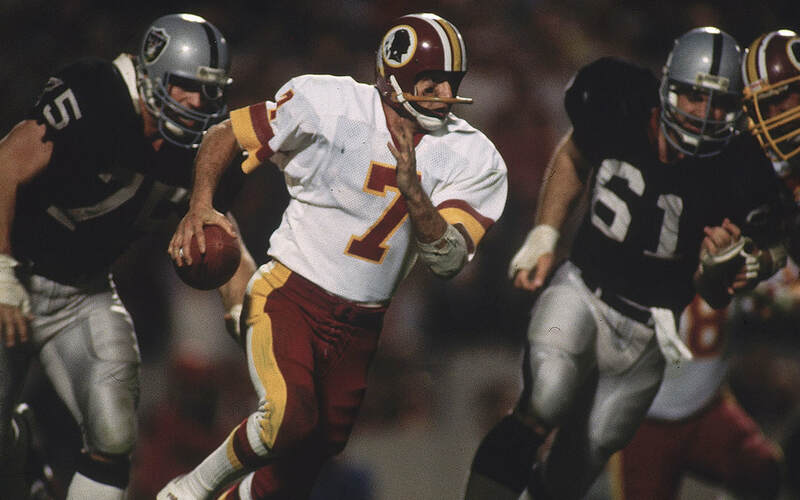 Joe Theismann had one of his worst games as a pro against the fierce Raiders' defense. The Riaders' Lyle ALzado and Howie Long, who had been a devastating duo all season, share a moment of reflection in the locker room following Super Bowl XVIII.